Steve, if youre worried about a whip ended bow just add a tip wedge maybe 6" or so. Replace the material you lost at .004 for the thickness. I came to the same conclusion. Adding a tip wedge that is. As usual, I'll probably make so many changes in the next bow that it will be hard to judge what had an effect. Carbon should be here tomorrow, so after looking it over I'll decide whether to include it in the stack. 30% to hit target weight. - Taper changed from 0.004 to 0.006 as per advice. - Number of laminations reduced to 3ea so that the ends of the tapers wouldn't be too thin to work with. My experience with the bow seems to follow past experience with increasing taper. The bow shoots a little sweeter (though not much in this case) and a bit slower. Actually this bow shoots just about the same speed, which I think is due to the carbon. The tips roll over more than the previous 0.004 taper bow which gives a greater string angle. I would have thought the bow would have stacked more because of it. But it seems to feel pretty good in the draw. Since the limb action has been pushed out I would have expected a more stable and forgiving bow. Not sure it really is. Had a friend listen while I shot the bow yesterday and confirm that it's a bit louder than my other bows... There's a tinny sound to it that I think comes from the carbon. I don't like that. I've been shooting it for about a week. It hasn't taken any set yet. So that's an improvement. I'll give it a while longer before deciding if I've made any progress. Well I've been shooting the bow for about 2 weeks since the last post. In that time I've scrapped a little and gotten the bow tuned up real nice. 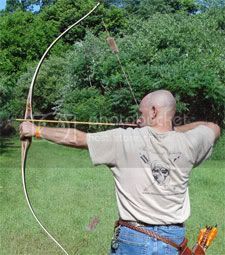 Looking at video of this bow being drawn / shot and my previous effort being drawn/shot there is no doubt that this bow is working better. It has quieted down as I've gotten it tuned. And it is a real nice shooting bow. I'm happy I switched to the 0.006 taper. Thanks for the suggestion! Don't think I would have gone there without it. Did you put the carbon over or under the glass on the back? I put the carbon under the glass. I added about 4 fps to the bow, and it shot well. Since then I've made another with carbon on both the back and belly with glass over it. That added another 4 fps I guess and it really shoots nicely. I think this will be my hunting bow this year if it holds up. I've been wondering about putting carbon on top of glass. I am wondering if the glass would give it a good foundation and protect it, or if it would not. I've also been wondering about laminating some fiberglass tissue, maybe 0.010 thick over the carbon before putting it into a bow. Would that protect the carbon well enough? Hmmmm. Several years ago I made a bow with just carbon on the back. It was not a particularly good performing bow, but I shot the hell out of it for several years and it has held up. I put a cloth backing over the carbon to protect it. The further from the outside, the less effect the carbon has. If I use carbon it goes on the back, without any glass under (or over) it. Glass on the belly. I've used carbon from Binghams, and from ACP Composites. I prefer the ACP material to the Bingham stuff, which comes from gordon glass I guess. But both types of carbon are easy to pull fibers from and damage with bare fingers. Where do you get your carbon that it holds up so well? Or do you do something to it?